Public comment closed today on whether a decommissioned bus depot at Kingston in Canberra will be preserved after several attempts at heritage listing. Australian Institute of Architects ACT Heritage Committee chairman Graham Trickett says he remains optimistic the listing will succeed after knockbacks in 2002 and late in 2009. But he is concerned that some parts of the structure may not be retained. "The ACT Heritage Council has recognised the significance of the steel frame built in 1940 but they haven’t recognised the additions," he says. He believes a gap in the proposal relating to additional brickwork leaves the door open for modifying the building at a later date. "The main objections would come from the owner which is a semi-government organisation, but you would assume they have agreed to the listing," Trickett says. If the listing goes ahead, Trickett says there could be a campaign to include a transport museum at the site which is currently used as a Sunday arts and crafts market. He says retired transport workers hold memorabilia and plaques that used to be held in the offices of the old depot. "There are several objects and memorabilia that could be displayed as part of a museum, as well as introduce larger items that are associated with transport in Canberra," Trickett says. "It’s appropriate that the front part of the building be used as a museum acknowledging the Kingston Bus Depot as the heart of Canberra’s industrial development in the 1940s." Trickett is in favour of retaining the markets, as it adds to the case for heritage listing. 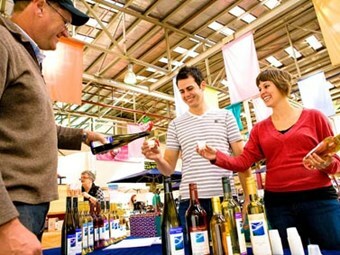 "The Old Bus Depot markets are one of the biggest activities in Canberra each Sunday, it’s a tourist attraction," he says. "In reality having the markets there is an adaptive use for the site." As for the final outcome, Trickett says a decision is likely to be reached by October. "But there is always the possibility that the ACT Government could object," he says.